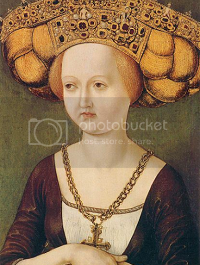 Anna of Franken ("Anna the Graceful") (1388 - 1450) was the wife of King Niklaas III of Arendaal and thus the Queen Consort of Arendaal and Suionia between 1408 and 1424. The daughter of Duke Uwe V of Franken, Anna married the Aren heir presumptive two years before he ascended the throne. 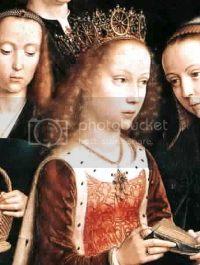 She was the mother of the Queen Regent Madeleine I of Arendaal, and a sister of Sebastian II of Franken. Anna's husband, Niklaas III was one of the first great Renaissance Princes of Europe. Encouraging learning, the fine arts and scientific advances, his court was among the most lavish and admired in the known world. Anna was a great patroness of the arts, both as her husband's consort and in her own right. 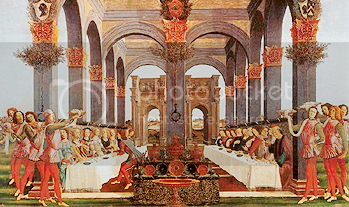 She held court with her husband in opulent style and commissioned many paintings, tapestries, books and even churches. She entertained and acted as patroness to poets, musicians and scholars. This made her very popular among the Aren cultural elite. She was also known for her charity, founding many hospitals and orphanages, which endeared her to the people at large. Because of her outstanding intellect, Anna often discussed the classics and the affairs of state with ambassadors. Moreover, she knew the painters, musicians, writers, and scholars, who lived in and around the court. Besides her knowledge of history and languages, she could also recite Virgil and Sylnarsson by heart. Anna was also a singer and musician, and was taught to play the lute. In addition to all these admirable accomplishments, she was an innovator of new dances which quickly became popular at courts across Europe.